An efficient Electronic Data Entry System is more and more important in today’s academic research and business climate that demands instant and accurate information and works simultaneously anywhere and at any time. In fact, according to (citation?) US businesses spend $360 billion annually to turn information they receive daily into better business solutions. At SiStat, we have implemented a large number of electronic data entry systems for a variety of industries such as academia, government, pharmaceutical companies and medical research organizations. 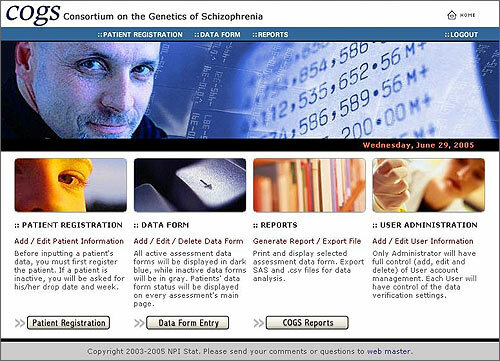 In the past, patient data was collected via paper and pencil and summarized manually. This long and painstaking process was marked by a high degree of human error. 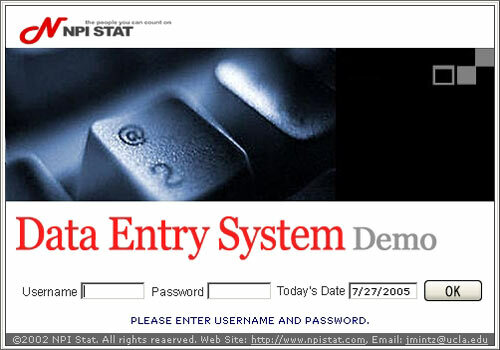 For over 10 years, SiStat has developed and worked with a Data Entry Solutions System to help our clients successfully collect and input their research data by using Windows or Web online systems. We patiently work with clients to comprehensively collect their requirements and specifications necessary for proper system architecture and analysis. We then initiate their system programs and deliver their completed system. We provide professional and efficient technical support for their custom-made system and amended requirements. Our quality control mechanisms reduce mistakes thus providing correct statistical results. Entered data is instantly available to all parties as soon as the data is updated. The real-time information is accessible 24/7 by all partners. Tracing data is available through a variety of search criteria. Clear and organized results help you gain applicable reports for further use. Information is stored on our network servers, protected behind enterprise-class firewalls and transmitted by our 128-bit SSL encryption. Unauthorized access to your data is virtually impossible. A system that is specific to your needs can be created without the need for expensive hardware installation or software downloads. With our services, you will get a sophisticated data entry system for a fraction of the cost. With a user-friendly interface, the system is simple to navigate and quick to master. With our system, your data can easily be converted into a variety of data formats for further use, such as for SPSS, SAS, XML, PDF, Excel (axles), Access (mdf)…and more. Authentication and Authorization Control when logging into the system. Individual Password for each user. Multiple Level Member Access Control. 128 bits SSL Data Encryption on Internet Transmission. In this procedure, two independent operators key in data. The data is then verified by the system. We have completed several large projects with accuracy of over 99.98%. This verification requirement is suitable for those who need strict quality control. The system generates verification reports to extract unreasonable or invalid data records for user clarification. Data Type of fields such as date/time, number or text. Cross Reference with Other Tables that exist in database. Cross Reference with newly added value tables, as directed by customer. The system provides professional user interface design for efficient input by users. The system provides a variety of search criteria to query and generate clear and organized results that help you gain applicable reports for further use. The system can dynamically output a PDF data form through combined static data and other suitable data retrieved from database. To meet UCLA security regulation, all our systems are Federal Information Processing Standard (FIPS) compliant. Please configure your browser properly in order to run our system in your machine. Click here to view step-by-step settings for Microsoft Internet Explorer and Mozilla Firefox.